I know, it sounds gross. But let me explain. 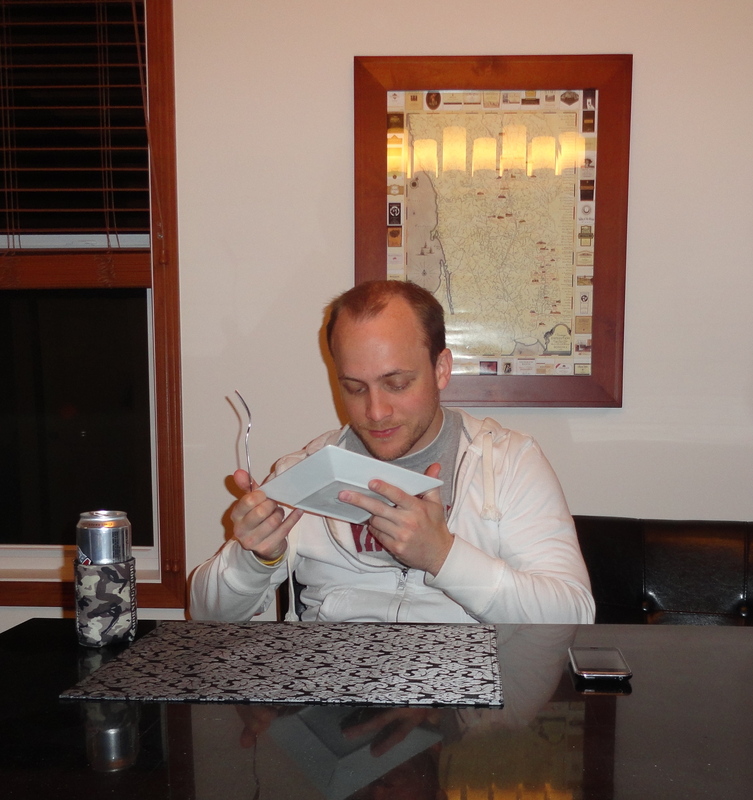 Over the weekend, the hubs and I went to our friends’ Slumber Party Massacre. It’s basically a great annual excuse to get together, play beer pong, flip cup, and watch scary movies (my favorite!). Unfortunately for us, the beer pong tournament lasted until almost 3 AM, so there was no flip cup afterwards 😦 Nate and I are pretty horrid at beer pong, but surprisingly, we did win two games, but lost two. So I suppose we are just okay, not horrid. Overall, it was a super fun night and we’re already looking forward to next year. So what’s with the ham pie, you ask? 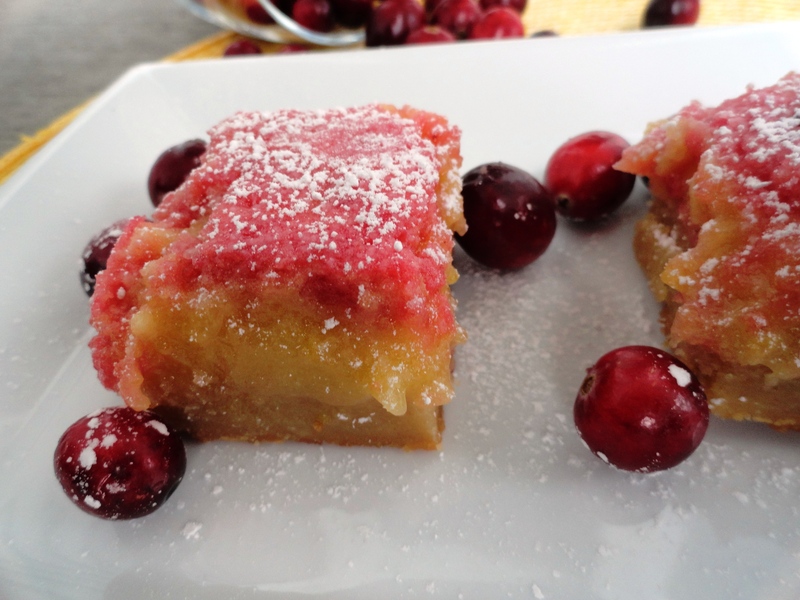 Well, for the party, I brought lemon-cranberry pie bars to share. I didn’t get the swirl just right, which just made for a mostly pink top. After a while, the confectioners’ sugar seeps into the topping, and the result apparently looks like ham. One of my friends truly thought it was an appetizer with ham on the top, coining the term “ham pie”. I’m not sure that name really sold many people on trying them, sadly. Nate and I both love them, so I suppose it’s everyone else’s loss. 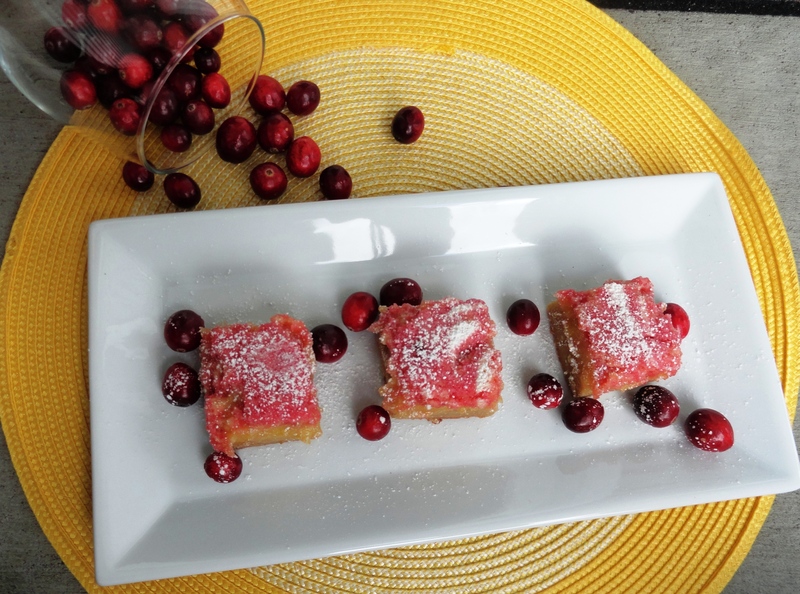 The bars are more or less a variation on lemon bars, with the addition of cranberry. The acid from the lemon and the tartness from the cranberries paired with the sweet crust makes for an excellent treat! 1. Make the crust: Preheat oven to 350 degrees. In a small bowl, whisk together flour and salt. In the bowl of a stand mixer fitted with a paddle, cream together butter and both sugars for two minutes on medium speed. With the mixer on low speed, slowly add flour-salt mixture. 2. Transfer dough to parchment paper lined 9×13-inch baking pan. Press dough over the bottom and about 1-inch up the sides all around (you can cover the dough with plastic wrap and press it in with the bottom of a measuring cup). Refrigerate until firm. 3. Bake crust for 30-35 minutes, until golden brown. Halfway through baking, remove from oven and use the back of a spoon to even and smooth the sides and corners of crust. Transfer pan to wire rack and let crust cool before filling. 4. Make the filling: In a saucepan, simmer cranberries, with 1/4 cup of the sugar, cloves and water over moderately low heat, until berries pop and liquid thickens, about 8 minutes. Remove from heat and let cool slightly. Transfer mixture to food processor and puree until smooth. Strain and press the puree through a fine sieve set over a bowl and let cool completely. 5. In a large mixing bowl, whisk together remaining 2 1/2 cups sugar, eggs, egg yolks, lemon zest, lemon juice and flour. 6. Mix 1/2 cup lemon filling with cranberry puree. Pour the rest of the lemon filling into cooled crust, and swirl in cranberry mixture. Bake at 350 degrees for 35 minutes, or until set. Transfer pan to wire rack to cool. Dust with confectioners’ sugar and serve. Since I made the apple pie boubon, I had all these apples that I couldn’t possibly toss. Good thing Boozed + Infused suggested making an apple pie with them! The recipe is for small hand pies, which sounds so cute, but since I was trying out a new perfectly flaky yogurt-butter pie dough crust, I made the whole pie instead. 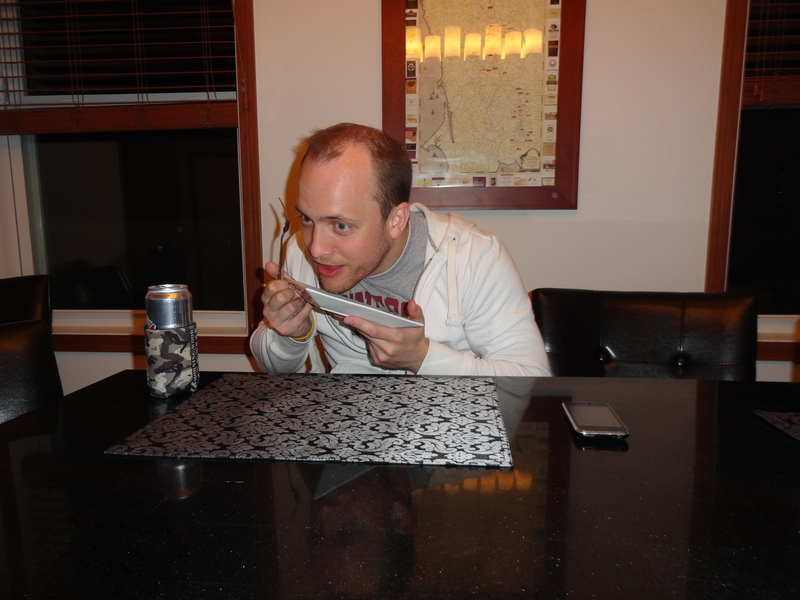 Nate was the only one who didn’t like this pie. He said he didn’t like the walnuts in the filling. If you have a picky eater, I would suggest leaving them out. 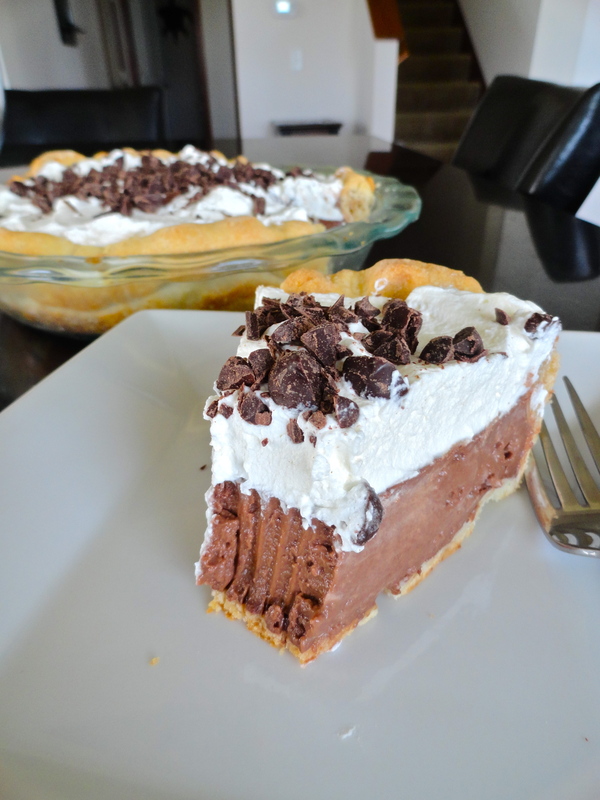 However, if you like to have a little bit of crunch to your pie, this was a great addition. I was so worried that the apples would be to liquory to even taste good, but the 15 minutes of simmering really cooks out the booze and brings out the infused flavors. I added more apples as I wasn’t sure that there would be enough to fill a pie, and I was right. 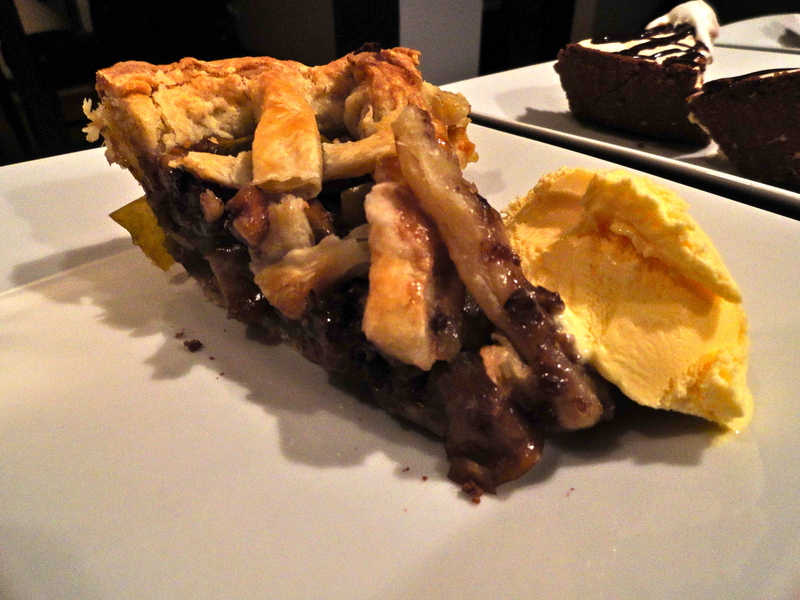 I added three more granny smith apples, but that still didn’t quite top off the pie. Next time I’d add 6 or so (of course this depends on how big the apples are, and these were the tiny granny smiths). Not only was the crust a success, but the filling was a hit, too! 1. Melt butter over medium heat in large saucepan. Add apples, brown sugar, lemon juice and salt. Bring mixture to a boil, then reduce heat to simmer for 15-20 minutes, stirring frequently. When apples are tender, whisk in flour. Taste mixture and add sugar to desired sweetness. Add walnuts and simmer for another 2-3 minutes. 2. Let mixture cool slightly. Fill prepared pie crust and bake according to directions. 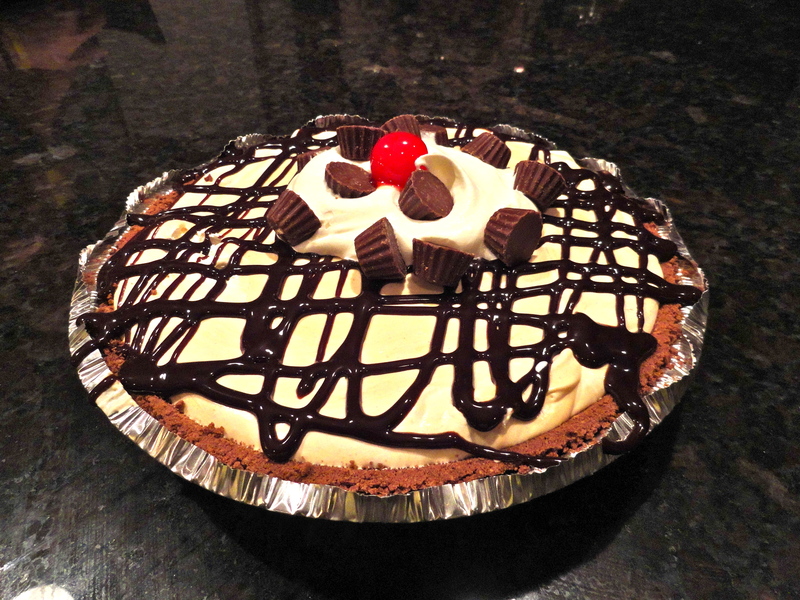 I had absolutely no reason at all to make this pie, but Saturday was rainy for most of the day, I was cooking away, and decided since I had all the ingredients, I might as well whip one up. Plus, it was one more thing off my 30 Before 30 list. Also, it gave me a chance to try my hand at pie crust making again. 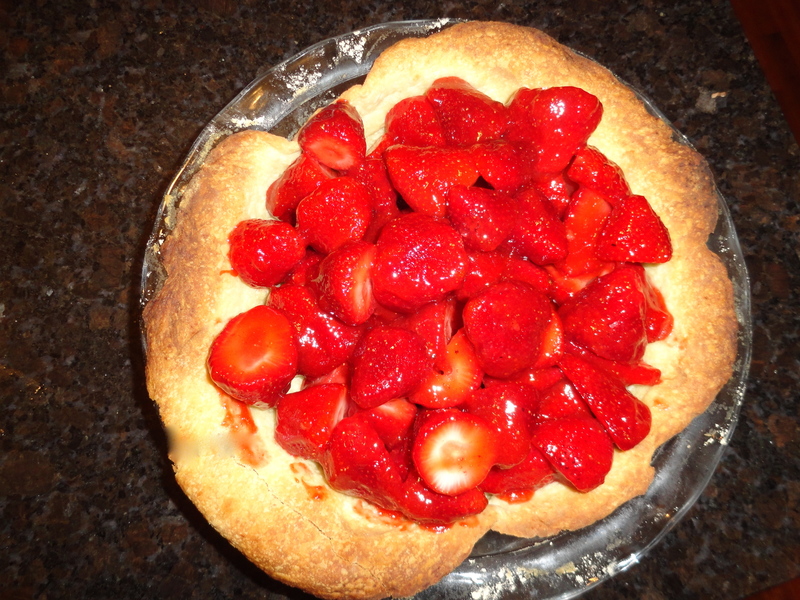 The first time I did it for my fresh strawberry pie, it tasted wonderful, but I completely forgot to trim and flute my crust. This time I felt almost like a pro, except for the fact that it slumped in one area while cooking, but oh well, it gives me another reason to keep baking pies, right? Pie crust is much simpler than I anticipated, based on what others make it out to be, and my second time went super smooth. I brought two slices to my parents this morning; another treat they got to enjoy for Father’s Day. I had to try a few bites myself, to make sure it wasn’t poisoned or anything. 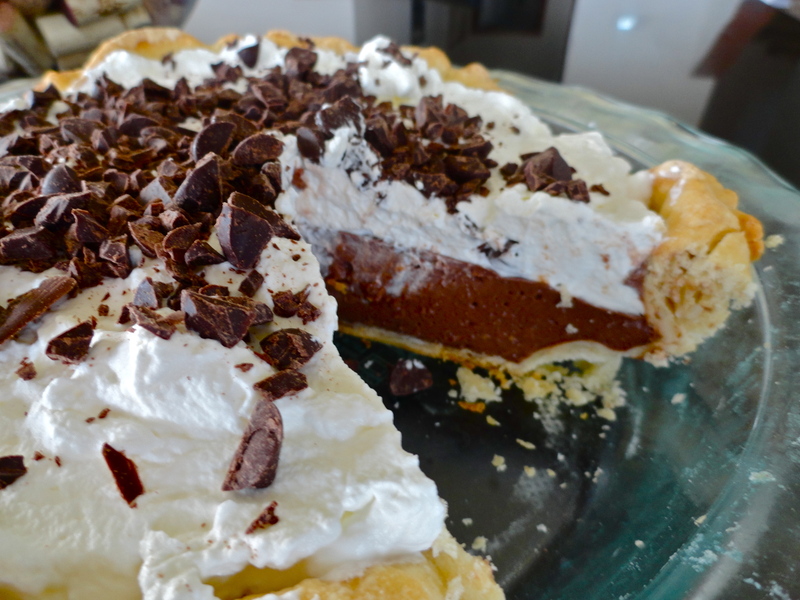 The chocolate was rich, but not heavy, and the fresh whipped cream kept the entire pie nice and light. The crust was flakey and buttery, perfect pie crust in my opinion (can you say that about your own pie crust?). I didn’t have any chocolate for shaving, so I just finely chopped some dark chocolate chips to garnish. It looked amazing, and it sure tasted amazing, too! 1. 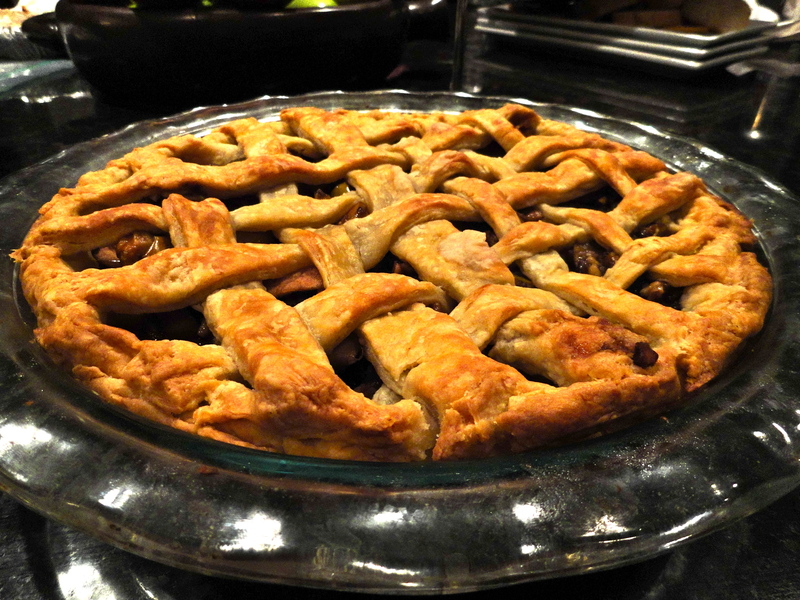 Make homemade pie crust recipe (find mine here) and set aside to cool. 2. In a medium sauce pan, whisk together cornstarch, sugar, cocoa powder, and salt. Over medium-low heat, slowly whisk in whole milk. Increase heat to medium-high, and let mixture come to a boil while continuously whisking. Allow to boil for 2 minutes. Remove from heat and whisk in semi-sweet chocolate and vanilla extract until smooth. 3. 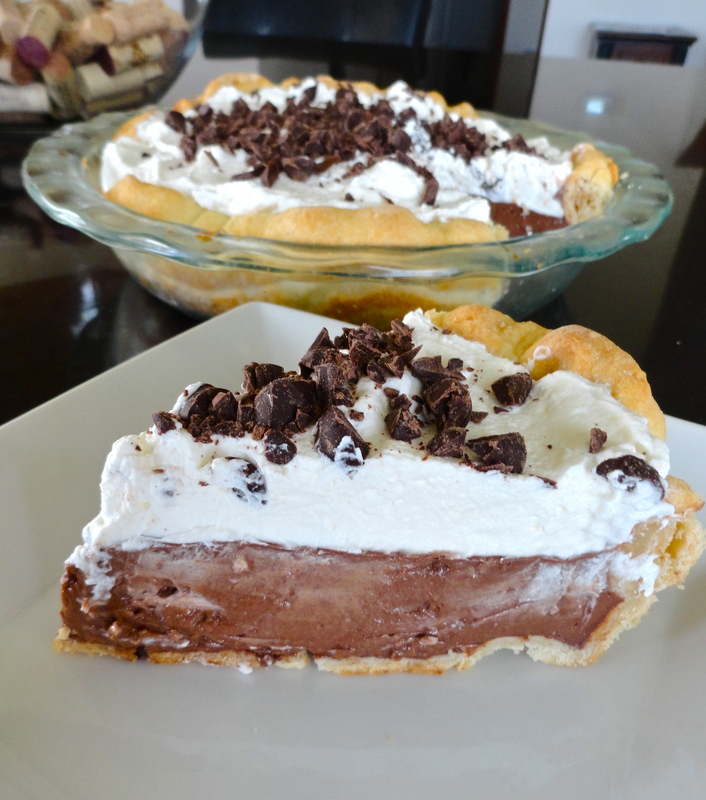 Pour chocolate filling into pie crust. Cover with plastic or foil, and refrigerate for at least 2 hours. 4. Just before serving pie, whisk heavy cream and confectioner’s sugar together in a stand mixer until it forms stiff peaks, about 3-5 minutes. Spread whipped cream over chocolate filling, and garnish with chocolate shavings. Before attempting my lattice top pie on my 30 Before 30 list, I figured I’d better try making a basic pie crust first. I found this recipe from the Brown Eyed Baker; she makes some amazing looking desserts! He also said that I needed to say he gave the pie “rave reviews”, which is a super nice complement for my very first pie. I’m disappointed about the crust, but there’s always next time, right? 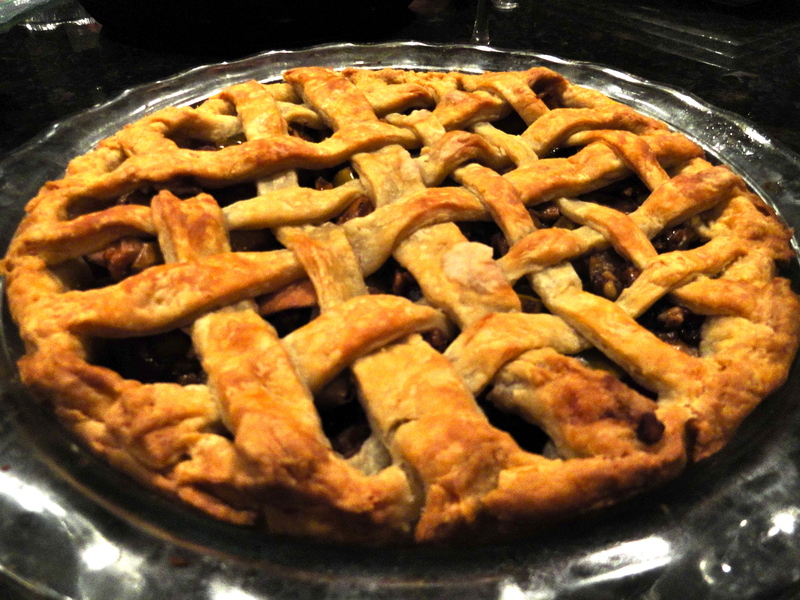 I’m not sure if I should perfect the basic crust first, or just jump into the lattice top. What do you think? 1. Pie Crust: Process 3/4 cup flour, salt and sugar in food processor until combined. Add butter and shortening and process until dough just beings to collect in uneven clumps, about 10 seconds (it should resemble cottage cheese). Scrap down sides of processor bowl and redistribute dough evenly. Add 1/2 cup four and pulse until mixture is evenly distributed throughout bowl and dough is broken up, 4-6 quick pulses. Transfer into a medium bowl. 2. Sprinkle 1/4 cold water over the mixture. Begin to fold together and press down using a rubber spatula until dough begins to become slightly sticky. Flatten into a 4-inch disc and wrap in plastic. Refrigerate for at least 45 minutes. Dough can be refrigerated for up to 2 days. 3. Remove dough from refrigerator and roll out on generously (seriously, really generous!) floured work surface. Roll out into about 12 inches round, 1/8-inch thickness. Loosely roll dough around rolling-pin and unroll into pie plate, leaving at least 1-inch overhang. Working around the circumference, ease the dough into the plate by gently lifting the edge of the dough with one hand, and pressing into the plate bottom with the other. Leave overhanging dough in place. Refrigerate until dough is firm, about 30 minutes. Let cool in pie plate to room temperature. 4. Trim overhang to about 1/2 inch beyond the lip of the plate. Fold overhang under itself; folded edge should be flush with the edge of the pie plate. Flute dough or press fork tines against the dough to flatten against the rim of the pie plate. Refrigerate dough lined plate until firm, about 15 minutes. Adjust oven rack to lowest position and preheat to 425 degrees. 5. Remove pie plate from refrigerator and prick bottom with fork a few times. Line dough with foil, and fill with pie weights or dried beans. Bake for 15 minutes. Remove weights and foil, rotate plate, and bake for another 5-10 minutes, until crust is golden brown and crisp. 6. Filling: Select 6 ounces of misshapen or unattractive strawberries, halving those that are large, you should have about 1 1/2 cups. In a food processor, process the berries to a smooth puree, scraping down bowl as needed. 7, Whisk sugar, cornstarch, Sure-Jell and salt in a medium saucepan. Stir in berry puree and cook over medium heat, stirring constantly, and bring to a full boil. Boil for 2 minutes to ensure the cornstarch is fully cooked; stir and scrap down sides frequently to prevent scorching. Transfer to a large bowl and stir in lemon juice. Let mixture cool to room temperature. 8. Pick over the remaining berries and half any extra-large ones, you should have about 2 lbs. 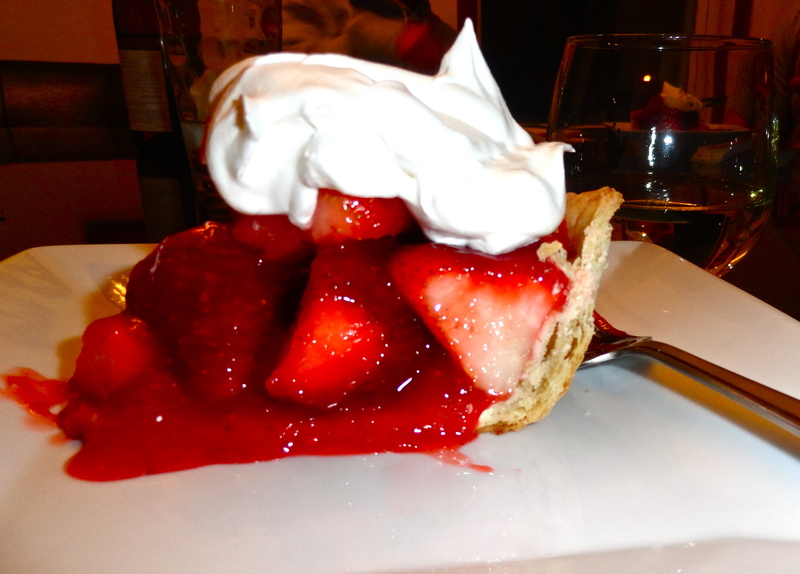 You can quarter the berries if you like, but I think the pie is more attractive with whole berries. Add berries to glaze and fold gently to evenly coat all berries. Scoop the berries into the pie shell. 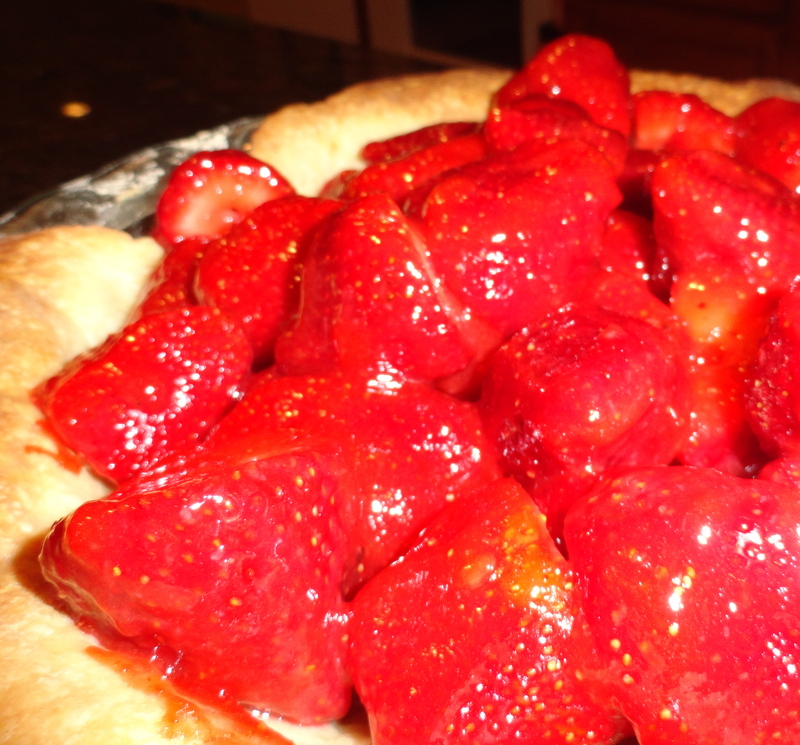 Rearrange berries so no cut sides are facing up and there are no holes, making an attractive mound in the pie. Refrigerate until chilled, about 2 hours.